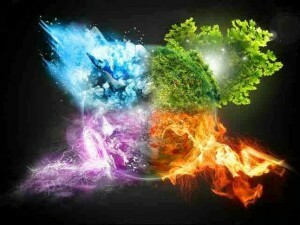 made up of one or more of the four basic elements: fire, earth, air and water. Each element contains three zodiac signs and these are known as triplicities. They are indications of energies and personality types. The elements have been divided into two groups, the active and passive. Signs under Fire and Air are considered active while under Water and Earth signs are considered passive. can be like playing with matches. They might unleash their pushy and forceful sides. blocking their inner peace and happiness. The earth signs are Taurus, Virgo and Capricorn. They represent material possessions and security. Under these elements are dependable, no-nonsense and sensible. One might find them to be people that can be rely on. They recover quickly from obstacles and maladies they undergo. hurt easily for the reason that water signs are so empathetic and emotional. And because all four elements are necessary to live a balanced and fulfilling life, we are compelled to compensate for those elements we are naturally lacking in our birth chart. We often attract people into our lives who are strong in our weak elements, and vice versa. Of course, these partnerships work out best when, instead of relying on the other person to make up for what we’re lacking, we learn to develop these qualities, inspired by the other person’s example. Take the plunge and live your life! First Free Minutes are FREE! How Important are Your Dreams? What is Your Zodiac Sign’s Flirting Style? Are You Really Ready For Love Now? How To Be Your Own Hero?